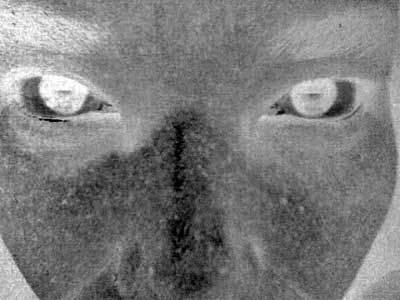 This week's Sunday Scribblings topic is: Out of this world" In this inverted photo my eyes subtly reveal their alien shape. Of course there is life beyond Earth. Humans feel that they are superior to 'other animals' (so much so that 'the human being' is rarely referred to as 'an animal'). This superiority complex leads many (most) humans to believe: "We are the only beings in this Universe." Is it possible that something as vast and incomprehensible as the Universe would limit itself to having humans as the only 'living organisms' or 'intelligent life forms' in existence? Humans can't even begin to comprehend the true scope of the Universe, much less all that is in it. When we walk down the road today, how many visitors will we see? It is easy to point out someone who looks foreign, either by the way they are dressed, the way they are looking around them with fascination and excitement (or confusion or disgust), the things they are taking photos of (or the fact that they are taking photos at all), etc. But how easy is it to spot the visitors we receive from other planets? Being one myself, I can tell you I know a few. * As young aliens sent to live on earth we go through this initial human confusion when we try to envision our home. How interesting and nice ending. Thanks for sharing a bit of 'your world'! You come from Venus. I come from Mars! And I'm a woman ,too. Since several years ago I've found I'm a martian! Nonconformist?!!!! Whenever my students are surprised to hear about my method or my thoughts or my attitude, I tell them: Okay, this is the way we live on Mars! Very interesting post. I relate much to this. If there was nothing at the beginnning , in what(substance or anything) did God create the universe? Forgot to say this post reminded me of Kelly Family's song "I'm in love with an alien". ooo - wierd! Your pic is in black and white but do you actually have green skin? Not any more. The process of evolution has resulted in our skin becoming brown over the eons ... for earthly camouflage purposes. You make me smile. And you are a very beautiful Alien. Perhaps all aliens are. I hope to meet more and more of them in my lifetime. Is Jasper from your "other planet" too? Yes, Jas also hails from Venus. Eureka! A great way to learn a language!